One of the greatest deficiencies that the Google price comparison site had was the absence of the occupancy filter in searches. You could only search for rooms for two people, something very common in many hotels but clearly insufficient in many others, such as business hotels (where bookings for single rooms are very frequent) or holiday hotels (where bookings for 3 or 4 people are highly common). It is true that you still cannot differentiate between adults and children (and their ages) but it will eventually come. 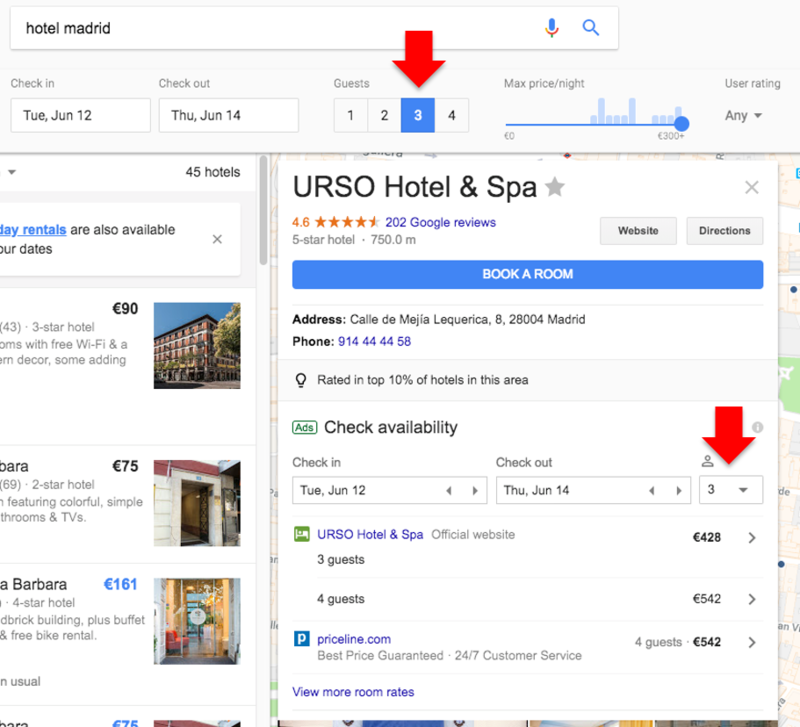 Occupancy filters now appear on Google Hotel Ads, something which is a major improvement of their product since it increases its reach to many more users. Given that many OTAs are limited to showing prices for double occupancy, this is a great opportunity for direct channels to practically gain exclusivity, funnily enough on the bookings of highest value. 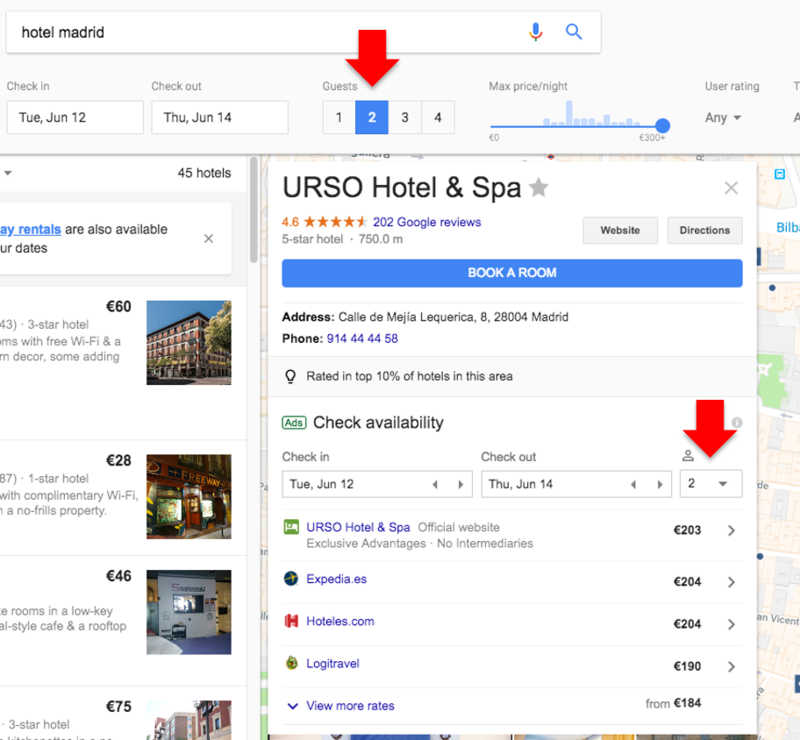 Although it is still being tested, an increasing number of users can now see the occupancy filter on your hotel’s listing (Google My Business) when checking prices. Don’t worry if you still cannot see it, you should be able to soon. If we change the occupancy to 3 or 4 people, we can see how the OTAs disappear and your direct channel stands out more and offers an exclusive and distinguished price. Also, it will help you improve the profitability of your campaigns, since it will increase the conversion of bookings of these occupancy numbers. 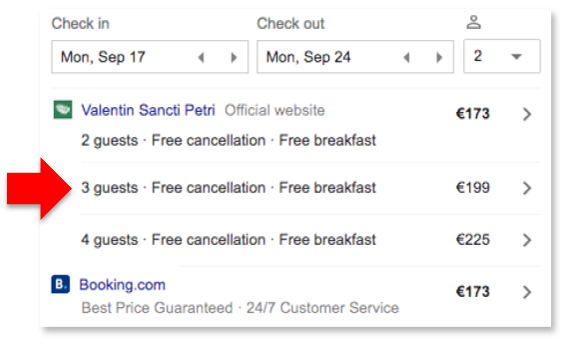 Along the same lines of offering more alternatives to its clients, Hotel Ads shows (according to Google’s own criteria) occupancy, cancellation policy and board alternatives, thus giving clients more options in order to allow them to make the best decision. In searches by destination (“Barcelona hotel”, “London hotel”, etc. ), Google openly competes with OTAs to capture clients who are looking for a hotel. Their tool is increasingly powerful and functional. Here, it has also incorporated the occupancy filters, which is yet another great opportunity to boost your direct channel. What do I need to do to seize this new opportunity offered by Google? You need a Google Hotel Ads Integration Partner (IP), whose job is to send all the occupancies, cancellation policies and boards to Google (Google publishes all of its partners here). This information is not published and you will have to ask each of them. At Mirai we already do this (we are one of the few), and our clients are enjoying all of these advantages without having to pay extra for it. We have always believed that metasearch engines are a fundamental part (despite the additional cost) of developing your direct channel and we are always committed to implementing all possible functionalities.